Well, here comes another tempest the National Football League can ill afford. Running back Marshawn Lynch, playing for the Oakland Raiders in a game against the New England Patriots in Mexico City, sat during the playing of “The Star Spangled Banner” but stood up during the Mexican anthem. And, Trump is right. Lynch should be suspended. The protests have helped caused an 11 percent decline in television ratings and a 4 percent decline in attendance at NFL games. Naturally, that’s hurting pocketbooks. Fox, CBS, NBC, and ESPN are on pace to lose about $500 million this year if ratings don’t improve dramatically for the NFL in the second half of the season. The controversy began during the 2016 NFL season when then-quarterback for the San Francisco 49ers, Colin Kaepernick, began kneeling during the national anthem to protest whatever was the trendy left-wing cause at the time. TV ratings declined during the 2016 season, and Kaepernick’s protests were the primary reason. Goodell had every opportunity to deal with the problem during the off-season, but seemingly ignored it. During week three of the 2017 season, President Trump spoke out forcefully against the protests. NFL players took the bait and, thinking they’d show Trump a thing or two, protested the national anthem en masse. That triggered a massive fan backlash, and the following week the protests were relegated to a few posers like Lynch and Michael Bennett. Anyone with two brain cells to rub together would have gotten the message: STOP THE PROTESTS! Instead, he spent his time dreaming up a new employment contract for himself that would include $49 million in annual compensation, use of a private jet for life, and health insurance for his family for life. Goodell currently earns $42 million a year under his current contract that expires in March 2019. Back in May the NFL owners voted to let a compensation committee, comprised of six of the owners, negotiate and finalize a new contract for Goodell. Jones, who is not on the committee, wants owners to vote on the final contract, a request that the committee has denied. Jones is feuding with Goodell, in part because of the anthem protests but also largely because of the six-game suspension of the Cowboys star running back Ezekiel Elliott. Elliott was accused of domestic violence by his girlfriend, but authorities in Columbus, Ohio, who investigated, refused to file charges. Goodell’s contract extension may be approved by the end of the year. Jones has threatened to file a lawsuit if NFL owners aren’t allowed to vote on the final contract. 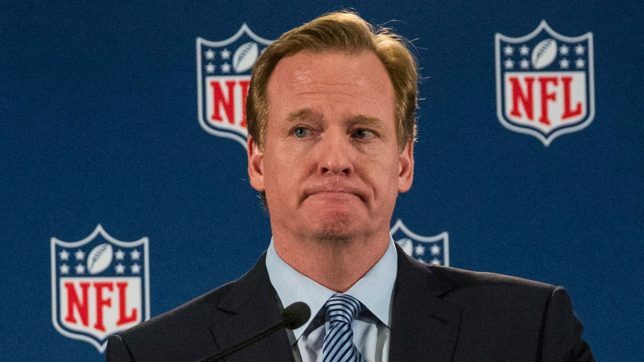 Goodell will probably go down at the worst commissioner in NFL history. Unless Jones prevails, Goodell will have many more years to cement his embarrassing legacy. David Hogberg is a writer living in Maryland. He is author of the book, "Medicare’s Victims: How the U.S. Government’s Largest Health Care Program Harms Patients and Impairs Physicians."